It seems to me that James MacMillan is one of the most � in fact, perhaps the most - interesting and eloquent composer currently before the public. He is a master of arresting sonority and his music, though often hard to assimilate quickly, is richly rewarding to the listener. Though particularly celebrated for some of his orchestral music, such as Veni, veni Emmanuel and The Confession of Isobel Gowdie, his choral music is a very significant aspect of his output. Like the music of Messiaen, an acknowledged influence, MacMillan�s work is inseparable from its composer�s very staunch and committed adherence to Roman Catholicism. But MacMillan�s religious outlook is also informed by a strong social, not to say Socialist, conscience - the Catholic Liberation Theologians are of great interest to him and an inspiration. So there is an element of gritty realism to his religious music, as is the case in the major offering on this CD. I had not been aware, however, until reading Paul Spicer�s excellent notes, that Kenneth Leighton was a strong influence on MacMillan also - though that knowledge now explains quite a lot. Spicer says of Leighton - and of MacMillan - that his music "... is passionately involving, wonderfully crafted and for those with ears to hear has the power to transform people�s lives." At least one of the works on this CD certainly possesses that power, in my view. Two of the pieces recorded here, On the Annunciation of the Blessed Virgin and Te Deum were completely new to me. Indeed, both are receiving their first recordings. The former was written for the choir of Gonville and Caius College, Cambridge. It is a setting of a rather lovely seventeenth-century poem about the Annunciation. It is laid out for five-part choir and organ. By employing long vocal lines, which are often high-lying and by having the organ accompaniment mainly in the higher reaches of the instrument, MacMillan brilliantly suggests the otherworldly radiance of the event that the poem describes. The organ part, in particular, adds a mystical patina to the music while the soft dissonance of the vocal writing imparts an air of mystery. The ending is most unusual. The poem ends with the words "Allelujah! We adore His name, whose goodness hath no store. Allelujah!" At the first "Allelujah" the organ pedals are employed for the first time and the music, hitherto pretty subdued in tone, achieves a brief, powerful climax. But this climax has scarcely arrived before the music dissolves into quietness once more. The choir sings the final "Allelujah" over and over in a dancing rhythm in which the organ joins. Eventually the organ is left to continue its soft, dancing figurations, which eventually vanish into the ether. This is a marvellous and original piece. No less original is the setting of the Te Deum. This was written to mark the Golden Jubilee of Queen Elizabeth II in 2002. MacMillan, whilst in many ways very respectful indeed of tradition, also defies that very tradition by penning a setting of this great hymn of praise, which, for long stretches, is subdued in tone. Yes, this is a hymn of praise but in this case those doing the praising are suitably awe-struck before the majesty of God. Imaginative touches abound in both the choral writing and in the accompaniment. The organ is used most resourcefully. For much of the time it is played at low volume. However, this means that when it plays full-out the effect is all the more dramatic. It�s a superb setting and one that I hope many choirs will take up. These two works are very fine indeed but in my opinion they are dwarfed by the stature of the third piece on the disc. Seven Last Words from the Cross had a slightly unusual origin. The piece was commissioned by BBC Television who transmitted each of the seven sections as a separate nightly episode in Holy Week 2004. The scoring is for mixed choir and a small ensemble of strings. 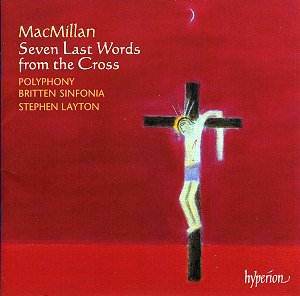 MacMillan took as his basic text the seven last sentences uttered by Christ on the cross. However, in the first, third, fifth and sixth sections he added passages of text taken from the Good Friday liturgies. To a Christian the events of Holy Week, and Good Friday in particular, have a very special significance and this is clearly the case with MacMillan for he later returned to this theme in the three substantial orchestral works that comprise Triduum (1996-97), where each work is inspired by one of the three days between Maundy Thursday and Holy Saturday. On Palm Sunday this year (20 March) I attended a very fine live performance of Seven Last Words from the Cross given in Gloucester Cathedral by a crack local choir - and they needed to be a crack choir, such are the demands of the work! The piece made a profound impression on me then � applause seemed almost an impertinence, richly justified though it was. Knowing that this recording was on the way, I have been eager for its arrival. Was it worth the wait? Without question! The first movement, �Father, forgive them�, begins quietly, almost gently, with the sopranos intoning those words in an insidious chant-like refrain over low string chords. The tension picks up as the male voices and violins enter, for their (different) music is quicker, more urgent. Thereafter the music proceeds in several different strands of speed, melody, text and rhythm, with each complementing the others yet also vying with them in a most effective collage. Eventually the music dies away with only the soprano chant left audible. The second movement is �Woman, behold thy son�. It opens with great choral outcries punctuated by tellingly dramatic silences. This slow and relatively straightforward material continues while the string accompaniment builds in fervour and complexity, growing faster all the time. Only at the very end, when the choir sing "behold thy mother" is new vocal material introduced. The next movement mirrors a crucial moment in the Catholic liturgy of Good Friday, the point at which the celebrant unveils a crucifix to the congregation in three stages. At each stage he sings "Ecce lignum crucem" ("behold the wood of the cross") and each time the singing is supposed to be at a higher pitch. The people respond by singing "venite adoremus" ("come, let us adore"). So in MacMillan�s setting the words "ecce lignum" are intoned three times in succession by a pair of soloists, firstly sepulchral basses, then tenors and finally altos. The choral response is warmly lyrical, almost romantic, accompanied by soft strings and a lovely solo violin line. I can only imagine that MacMillan here wanted to convey joy and thankfulness at the sacrifice of Christ on the cross. After this material has been presented three times comes a remarkable passage in which the strings elaborate on the "venite adoremus" music. As Paul Spicer says, the string writing here is right in the great tradition of English writing for strings, with Tippett a particular point of reference. After that interlude we finally hear the words of Christ. "Verily I say unto thee" sung in alt by the sopranos to music that is ethereal and most effective, while underneath them the violins recall (I think) the "venite adoremus" music once more. The fourth section, �Eli, Eli, lama sabachthani� is begun sepulchrally by first the string basses and then by their vocal counterparts. Gradually MacMillan takes the music up into lofty registers by adding higher voices, both vocal and instrumental. As he does so he increases the intensity. As the textures expand the music acquires what I can only describe as an austere richness. The vocal lines are highly decorated and this adds tremendously to their expressive effect. At its peak this is really anguished music. Eventually, however, the music unwinds down into the depths from which it originated. We have heard a musical and emotional arch. The fifth movement, �I thirst�, also begins in the choral depths. The words "I thirst" are sung by different sections of the choir, and thus at different pitches, against sustained string chords. From time to time there are rapid interjections of repeated notes from either the singers or the players but despite these interventions I find there is a prevailing sense of stillness. The penultimate movement, "It is finished", has a violent, even barbaric opening as repeated, jagged and dissonant string chords depict graphically the nails being driven into Christ�s hands and feet. But after this the sopranos sing words from the Good Friday responsories for Tenebrae while again and again the other voices sing the words "it is finished". This is music of desolate beauty. It�s also serene and dignified. Towards the end the vicious string chords return, pitted against the sopranos, and in the end it is the strings that have the last word. The final movement follows without a break. There is a great three-fold choral outburst on the word "Father" but the choir quickly sinks down, as if in exhaustion. Remarkably, though the last movement plays for 8�10" in this performance, the choir is silent after 1�13". It is as if words are inadequate and MacMillan can only conclude his contemplation of this event through "pure" music. The string music with which the work concludes is quite extraordinary. There is a pronounced influence from traditional Scottish laments and MacMillan�s music summons up, for this listener at least, a bleak vista (a desolate Scottish moor? Calvary?). The orchestra meditates on the music that has gone before, recalling (I think) fragments of material heard earlier. This is another passage of desolate beauty. Gradually the music dies away almost into nothingness. We hear fragments, wisps of music, punctuated by silences that become ever more pregnant with meaning. The music is infinitely sad yet, for me, the harmony, spare though it is, has just a trace of warmth, hinting, perhaps, at the hope that, for Christian believers, comes out of the horrors of Good Friday. Though in many ways the context is entirely different I was put in mind of the last page or so of Mahler�s Ninth Symphony. Eventually the music fades away completely and the listener is left to meditate. Four months ago in Gloucester Cathedral my first encounter with Seven Last Words from the Cross made a profound impression on me. I suspected I had heard a masterpiece but could not be sure after one hearing. Revisiting the work now at more leisure I am absolutely convinced that it is indeed a masterpiece. It�s an extraordinarily eloquent, harrowing, disturbing and very beautiful work. It is also a profound utterance in which the already powerful imagery in the texts has been rendered even more potent by the way in which the music has been married with the words. No praise is too high for Stephen Layton, his choir and the players of the Britten Sinfonia. They give a committed performance of stunning virtuosity and the singers are no less successful and authoritative in the other two pieces. They are excellently served by the engineers, who produce a most satisfying and truthful sound. Paul Spicer�s notes offer a splendid introduction to the music and the full texts are provided. I just have one small quibble. Seven Last Words is the first piece on the disc, followed by the other two. For all sorts of reasons, not least the fact that Seven Last Words ends so quietly, I would have placed it last. One just wants silence after such music. This is a magnificent and very important disc. I know it will feature as one of my Recordings of 2005 in due course. For now I congratulate Hyperion and the performers on an issue, which is an unqualified success, and I recommend this CD not just enthusiastically but urgently.